A rapidly cooling evening primed Kenilworth Park for fast races at the DCXC Invitational, conditions that D.C.-area cross country runners have ached for all season. Heather Holt‘s 16:56 and senior Saurav Velleleth‘s 15:01 times on the 3.07-mile course were just the fastest of likely hundreds of personal records, even adjusting for the slightly short course. 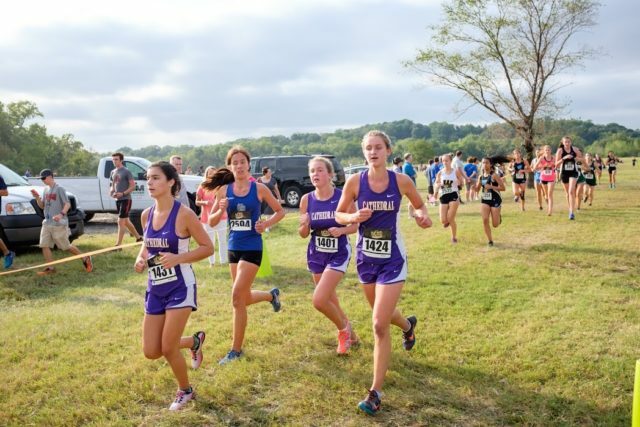 Now in its third year, DCXC played host to the four-class varsity race structure that pitted runners against opponents from their graduating classes, and let nearly 1,400 runners compete in varsity-level races. Races started at 11 and lasted until 6:30, with elementary school, middle school races combing with high school races to total 2,381 finishers, of whom 2,095 were high schoolers. Spectators were treated to 17 different sprints to the finish line. For the runners, the class races let them see how they compare to their peers. 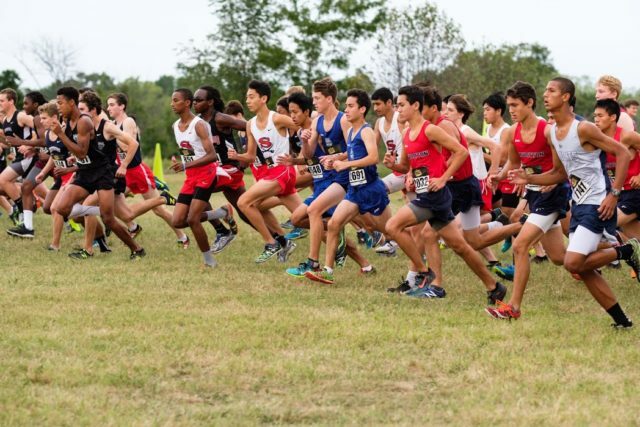 And coaches got a clearer picture of what what they have to work with, especially on boys’ teams, where most top sevens comprise upperclassmen and younger runners develop in JV and freshman races. 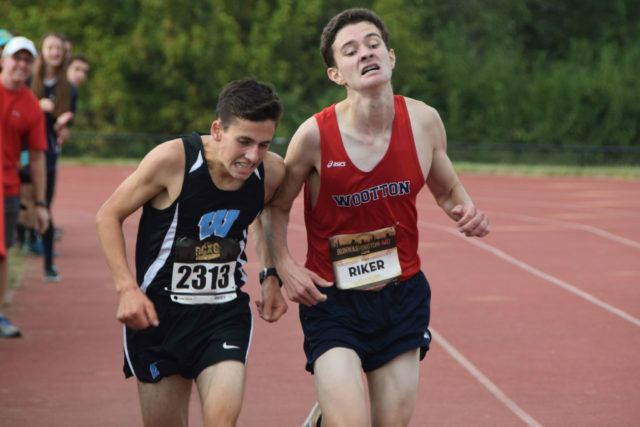 Chris Pellegrini saw a lot to like in his West Springfield boys, and not just Chris Weeks‘ runner-up finish in the freshman race. Three — Sam Pritchard, Gian Trujilo and Chris Lozano — finished together at 17:51. The Walter Johnson girls’ junior class, led by second place Abbey Green, had Sadie Keller, Sophia Scobell and Janet Scott in sixth through eighth places. 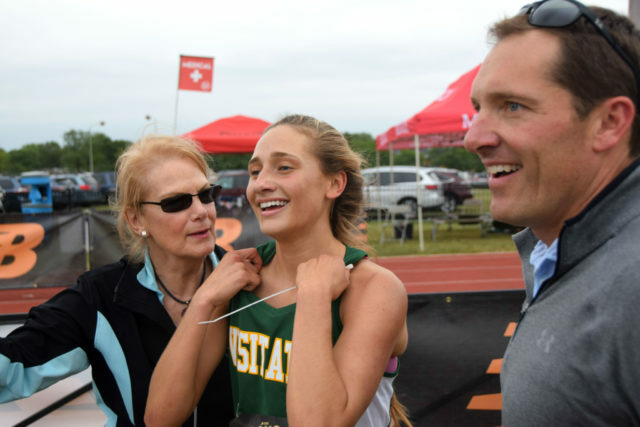 When combined with Katrione Kirsch‘s runner up finish in the senior race, bodes well for the Wildcats, not just this year, when they will try to defend their Maryland 4A title, but next year, too. Gonzaga and Wootton claimed to top overall team awards for boys and girls, respectively. Rookie Megan Lynch, from Georgetown Visitation, stormed to a 16-second win over John Champe’s Bethany Graham, starting with a 5:38 first mile. Graham clawed her way back to within seven seconds at the two mile (Lynch was through in 11:49, Graham in 11:56) before Lynch reasserted her margin over the last mile. Lynch is a lacrosse and basketball player who picked up cross country for conditioning purposes. Zoe Cachion, from Arlington’s Washington-Lee, snagged the last medal at 25th place. Though a freshman, Cachion is a seasoned runner, coming from a family of runners and having the opportunity to run with the W-L team as an eighth grader. “Each time I run is a new experience and a chance to do better than last time,” she said. Mikaela Vento is visiting D.C. with her Hempfield team from Greensburg, Pa. She was not optimistic during the team’s tour of the course on Friday. “We thought it was going to be horrible, the sun was beating on us like crazy,” she said. “But when we got here, it was cool and much better. 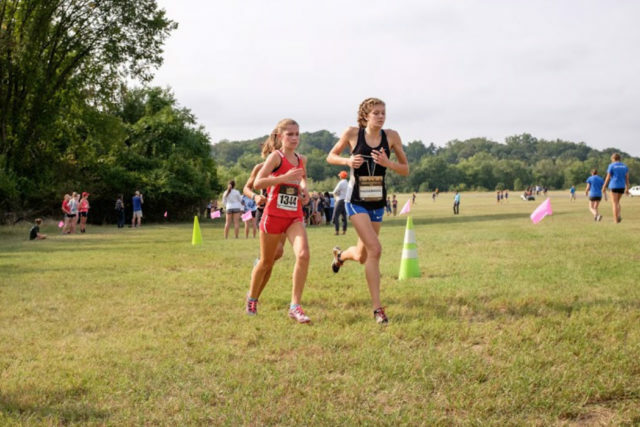 Out coach has us do a lot of hills and that really helped with this course because it’s really flat and made it a lot easier than what we’re trained for,” said Vento’s teammate Rebecca McFadden. Nicholas Karayianis and Chris Weeks raced a week prior to DCXC at the Adidas Cross Country Invitational, where Karayianis, of Maryland’s Winston Churchill, had a 12-second lead on Weeks. This time Weeks closed the gap, trailing by only one second, 16:37-16:38. By the middle of the race, he knew that was paying off, because he was in control. Weeks was encouraged by the improvement he made in a week. “I knew the last few days things were going to go pretty well,” he said. Gonzaga’s Cullen Capuano benefited from his teammates’ experiences over the last two years racing here. 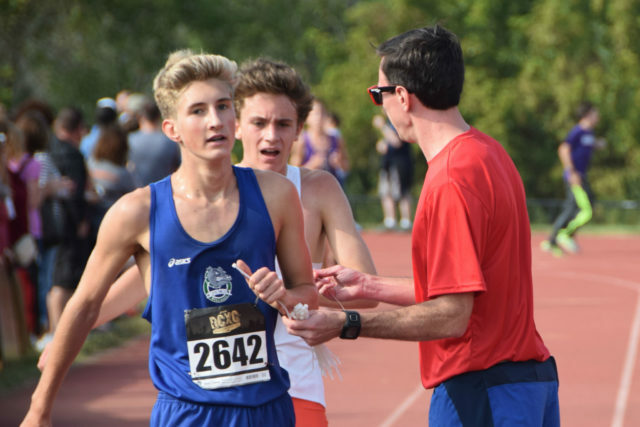 Speaking of hills, William Gay, from Champe, still remembers how his quads and calves killed after the climb in mile three at Oatlands seven days earlier. Not so this week. Isaiah Luckey, of Woodbridge leaned into the punch that comes in the middle of a cross country race. “It was good the first half, but my legs started burning in the second half,” he said. Rather than take that cue to slow down and lick his wounds, Luckey sped up and ultimately destroyed his PR by roughly a minute. “I had to go fast…I felt people catching up to me, ” he said. “Last time, I went out too fast. This time I let them go and chased people down. Ava Hassebrock finally got a race that satisfied her, running 18:12 for a 13 second margin. Though the Tuscarora sophomore has a frustrating start to her season, trying to improve on her freshman outing that saw her finish fifth at the Virginia 5A championship, she credited her mental toughness and attitude in propelling her to a win over Poolesville’s Nandini Satsangi, with whom she had dueled over the first two miles. 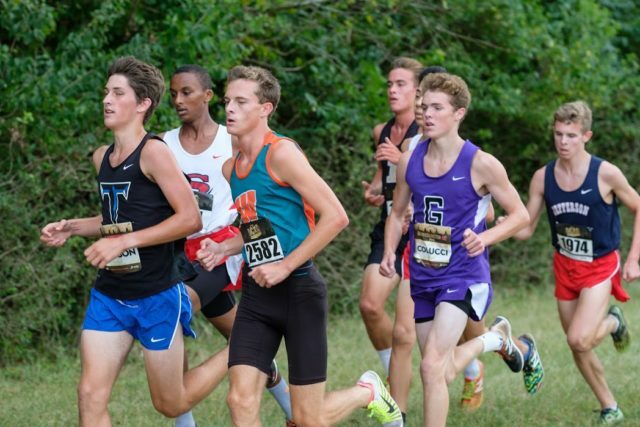 The pair finished in the same order in the 2015 DCXC freshman race. That said, she admired the duck feather Satasangi tucked into her hair. “I love ducks,” Satasangi said. “I have so many duck stuffed animals at home. I always wear a feather in my hair. McLean’s Caroline Howley was making her season debut after missing most of September with a knee injury that forced her onto an Alter-G treadmill. Josh Shackelford had high hopes for swinging into D.C. from Gloucester County, Va. and winning the sophomore race. He did, but he had to settle for third place between two new Montgomery County, Md. rivals who learned a lot about each other in the closest finish of the day, when Aaron Bratt (Walt Whitman) and John Riker (T.S. Wootton) both ran 15:37, with Bratt getting the edge in a lean. “I don’t like to kick, so I wanted to make sure we were fast from the start,” he said. Riker’s coach Kellie Redmond described him, even as a freshman, as being analytic to the point of writing several-page race reflections. Bratt said it was the pair’s first time seriously racing each other, but he expected the two to continue to improve together. “It’s going to be exciting racing him for two more years,” he said. Though Shackelford expected to win, he was thrilled with a 40-second PR and to be healthy after a bout with anemia last fall. Holt went out hard from the gun, aiming for Weini Kelati‘s 17:45 record from the meet’s inaugural race in 2014. She had a four-second lead on Green at the mile, coming through in 5:16, then split 10:50 after a 5:34 second mile. Confidence made a big difference for Holt. She felt confident she could dip under 17 minutes, but it took about all she had. It wasn’t just her teammates’ parents cheering her on. Holt got the sense that seemingly everyone on the course knew how hard she was pushing and booster her resolve. “It’s an amazing community,” she said. 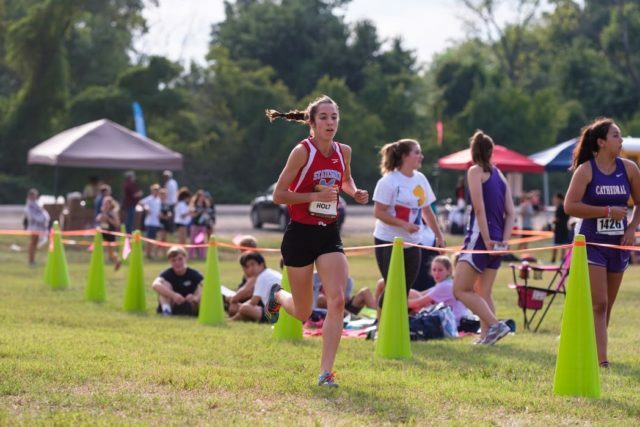 Walter Jonhnson’s Abbey Green was hoping to narrow the margin between the two after last week’s Oatlands Invitational but was stymied in part by box assignments, with her Walter Johnson team on the opposite end of the starting line from Holt’s George Marshall team. “I just tried my hardest to keep on pace, close the gap a little,” she said. Having run DCXC before, when she finished third in the 2015 sophomore race, Green knew the race was an opportunity to run a fast time, but she was guarded in her optimism. Last year’s race was a bit of a shock because Green had never run such a fast course. Holt’s teammate Ava Bir finished third in what she described as a rebound. 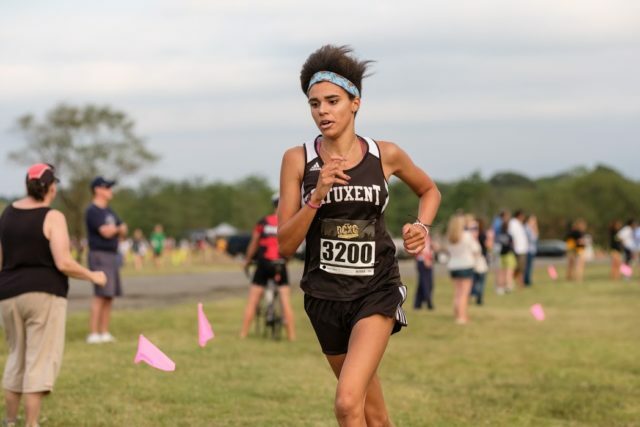 Though DCXC has become a race where people come to run fast, all-out, Bir was hoping to take away some lessons about racing tactically, but with more than 90 seconds between her and Green and a 26-second cushion over fourth place finisher Kenady Horne, she spent the entire race alone. That said, the course was too flat for Bir. “I really do better on hilly courses,” she said. Emma O’Brien from Columbia, Md.’s Atholton scored a 2-minute PR, putting everything together in what she called a special race. Derek Johnson joined Hassebrock as an individual winner from Tuscarora, and moved up from his runner-up spot in last year’s sophomore race. Last year, he thought he could hang until he lost in a sprint at the end. But he didn’t expect to run 15:21 for a 5-second gap over Jay Hall, from Charles County, Md.’s Westlake. Jay Hall took the opportunity to race some fast guys, and he made the most of it by improving by roughly 45 seconds from the Nike Cross Southeast race. He won the freshman race in 2014 before spending a year at Gonzaga. After this year’s race, he was surrounded by his old teammates, having shown them that even though he lives on the far western edge of Montgomery County, he hasn’t fallen off the face of the Earth. Like Lockett, the J.E.B. 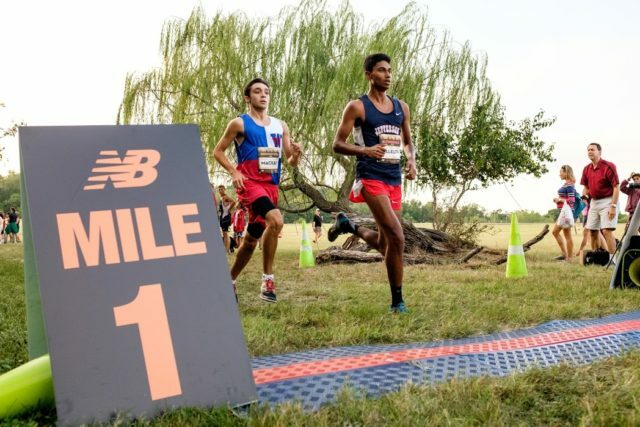 Stuart junior duo of Natnael Asmelash (6th, 16:08) and Matthew O’Cadiz (8th, 16:17) are reaping the benefits 0f more summer mileage, up to high 40s after years in the 20s. “I felt like the first two miles (10:02) were faster than I usually go, but I felt a lot better in the third mile. A little good-natured teasing has come back to bite Leah Walker, but in a good way. Her daughter, Hayley Jackson, didn’t know what cross country was, a week before she started high school at Patuxent. When she found out, she asked “who would run three miles for fun?” A former Calvert High star, Walker challenged Jackson, who was looking for an after-school activity when he dreams of being in the school play were dashed. The track talk in their house has focused on helping Jackson go forward from there, a path that has , so far, added up to a pair of 2A cross country titles. As for why she ran fast at DCXC, winning the senior race in 17:42, the answer was more tangible. Though she suffered from some asthma during the race, she pushed those struggles aside by doing free association exercises. Walter Johnson’s Katrione Kirsch trailed by 30 seconds, and in the process ran a 40-second PR. When Jackson went hard from the start, splitting 5:33 to Kirsch’s 5:43, Kirsch just wanted to keep Jackson in sight. She held off Winston Churchill’s Julia Reicin by three seconds. Westfield’s Didi Pace viewed the race as an opportunity to really go for a fast time. Her success created a feedback loop. Saurev Velleleth defended his class’ title, again, running 15:01 for the day’s fastest time. “I was debating different strategies before the race but when I was on the line I just decided to go for it, run for a big PR,” he said. T.C. Williams’ John Mackay followed him through the mile in 4:49 and the two mile in 9:43 before Velleleth put a five-second gap on him in the last mile. “I just went out and stuck with him,” Mackay said. “I was proud of myself for doing that. Last year I had a lot of confidence issues, I’d see people on the line and know I couldn’t beat them. Harry Monroe continued Gonzaga’s strong showing with a third place finish in 15:21.